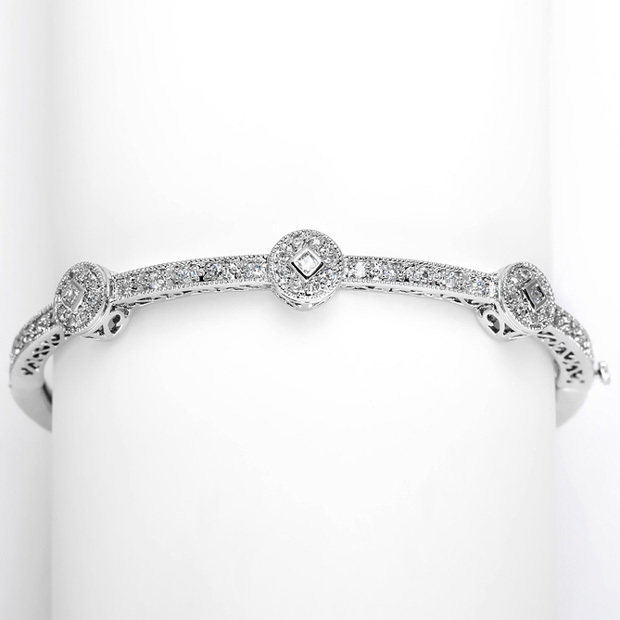 * Mariell's 8" vintage wholesale bangle bracelet has detailed etching on the sides and a striking Art Deco Cubic Zirconia pattern going fully around the bangle. * Plated in lustrous silver rhodium using the finest quality CZ's, this bangle looks like genuine diamonds and platinum. * We even use the safety clasp found in fine jewelry. * The hinged opening is great for ease of wear! * Whether for brides, mothers of the bride, bridesmaids or proms, this heirloom bracelet will be loved and worn for years and years to come! * Plated in silver rhodium, our heirloom bangle has "the look of real" & a hinged opening for ease of wear. * Brides, bridesmaids & mothers of the bride love this antique look!